Having a home server or a NAS is a great choice for people who look for a personal storage space for their media. In addition, we have previously covered several other uses of a home server. But the hardware is nothing without the software powering it. We have already listed the best Linux distros for a home server. Today I will show you 9 best home server apps to automate media management, so you get the latest Movies, Music and TV Shows in the best quality available. For me, Sickrage is the best service for automating TV show downloads because besides having the same functionality as Sonarr, Sickrage can also download subtitles. It is not as fast as Sonarr, but the improved functionality makes Sickrage my preferred service for downloads. Sickrage is compatible with Windows, Linux and OSX and also, it is compatible with a wide list of NAS devices. Sickrage is one of the best NAS services available to automate media management tasks. Just like Sonarr, you can install Sickrage in Docker and enjoy all the benefits offered by Docker and containerization. By using Docker, you can install Sickrage in just a few minutes, and in the future, you will be able to migrate your service to another machine without having to reinstall and configure it again. Of course, Sickrage is compatible with Cardigann and Jakett to enable more search providers and you can also control Sickrage remotely using ShowsRage for Android. We talked about TV services in order to automate media management, but some will ask if there is any service available for downloading Music. Enter Headphones, which is one of the best home server apps, allowing you do create a wanted list for your Music albums and download them automatically based on your quality presets. For me it was not as reliable as other services because sometimes it downloads wrong files, but most of the time it gets the job done and for now, there is no better alternative. Just like the other services mentioned in this article, Headphones is compatible with Windows, Linux and OSX. You can also install this service on NAS devices but i noticed that it does not have the same support as Sickrage or Sonarr. Of course, I recommend you to install Headphones in Docker in order for you to have all your services in one place. Radarr is a relatively new service, made specifically for downloading Movies. It's based on the same interface as Sonarr, so new users that have used Sonarr in the past should be right at home with Radarr. You can create watch lists for Movies with your preset quality settings and Radarr will automatically download them as soon as they are available. Being a new service, you may think that it will not work as good as Couchpotato but in most cases, it works better and it's easier to configure. Radarr is compatible with Windows and Linux, and it's starting to be available as a package for NAS devices. I am sure the support will be better in the future, as the development progresses. Because it's based on Sonarr, Radarr is also compatible with Cardigann and Jakett so after configuring one of the mentioned services, you should be able to get the best results. 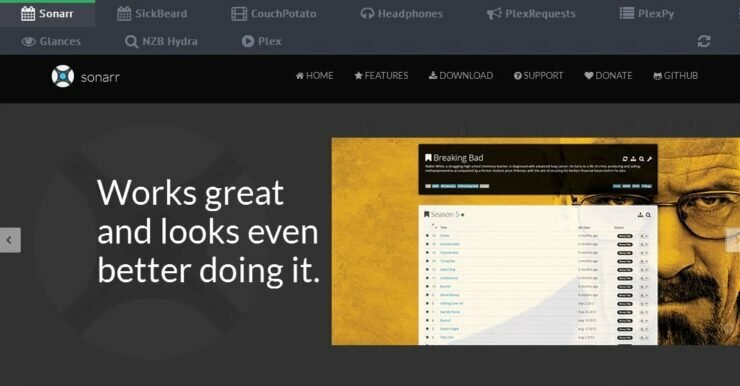 All in all, Radarr developers are hard at work, and are creating a good service which is a breath of fresh air for users that were looking for an alternative to Couchpotato and for me it already is one of the best home server apps. 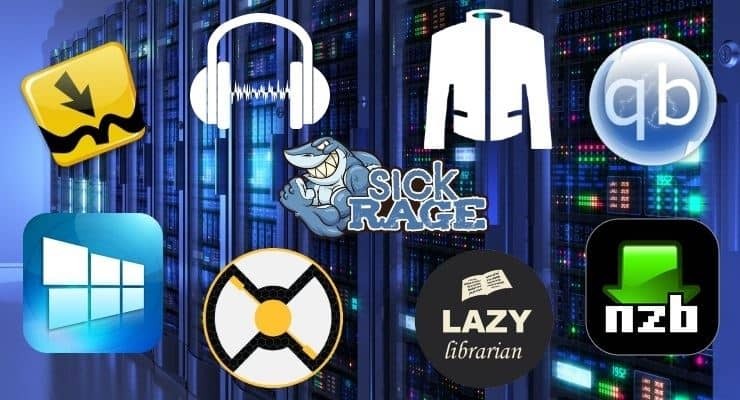 Jackett is a service that acts like a proxy server and translates queries from other apps like Sonarr, Sickrage and CouchPotato. This allows you to use more search providers and you can manage this service as a single repository removing the burden from other apps. 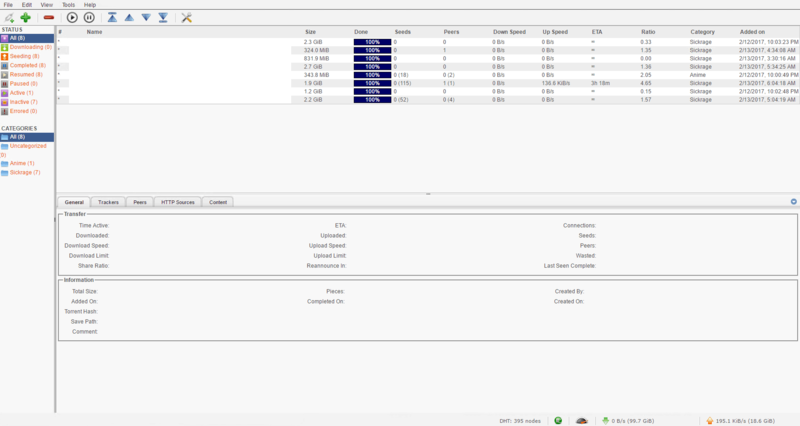 Custom torrent providers are also supported by this service. The Jackett service is supported by multiple operating systems like Linux, Mac OS X, and Windows. 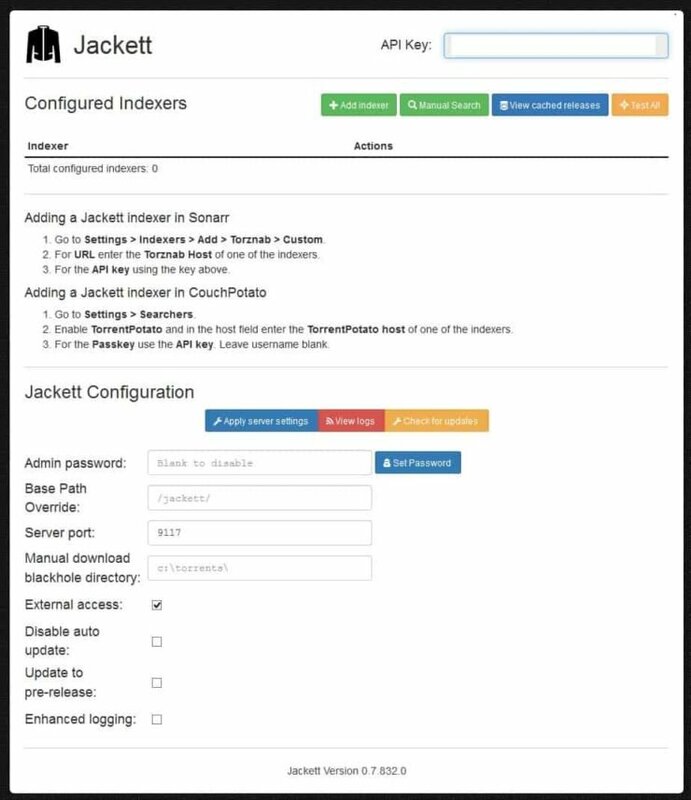 You can also install Jackett in Docker in just a few minutes making the setup a breeze. I install Jackett on each media server I own because the base for good searches and results are always the providers, and Jackett offers a wide collection even if the main download services are not. qBittorrent is one of the most used torrent clients being a great alternative for the popular uTorrent client. Currently, qBittorrent is one of my favorite Bit Torrent clients because it offers a clean and functional interface, without being too resource hungry. qBittorrent is compatible with Windows, OSX and Linux, and it's starting to be available as a package for NAS devices. I noticed that after a couple of weeks of uptime, qBittorrent tends to suffer from memory leaks on Windows, forcing you to perform a restart of the service from time to time, but this happens only if you are running more than 200 torrents at the same time. The easiest way to install it on Linux is by using our AtoMiC ToolKit, a tool that makes the installation of services accessible for everyone so make sure you check it out. NZBGet is a multi-platform binary newsgroup downloader alternative for SABnzbd offering a lower memory footprint and it allows automatic downloads and post-processing, making NZBGet a great service to automate your downloads. You can install this service on a wide range of operating systems like Windows, MAC OSX, Linux, BSD and it is also compatible with routers, NAS devices and some media players. It is really easy to install NZBGet on Linux by using our AtoMiC ToolKit but there are also other Windows and OSX installers available. In order to get the best usage from NZBGet, make sure you check out or guide on how to choose the best usenet provider guide where you will find the best usenet providers for your needs. We talked about Muximux in our previous posts, but to recap, Muximux is a lightweight portal that allows you to manage and view your HTPC services and apps. By using Muximux, you will be able to manage everything from a single unified interface, without the need of keeping multiple tabs open or bookmark the URLs for each app. I think each user should install Muximux on their server because it makes management of your services really easy and if you want to remotely manage all of your service, you just need to port forward a single port. Muximux just hit the 2.0 version so it's more stable than ever. You can install Muximux in Docker in just a few minutes then you can start adding your favorite service interfaces to it. Most of us use a server to automate TV Shows, Movies and Music downloads, but there are users who would like to automate their comics download process, so Mylar is the perfect service to do that. Mylar has a friendly interface, similar to Headphones turning the search and download process for comics an enjoyable experience. You can install Mylar using our AtoMiC ToolKit, and in just a few minutes, you are ready to go. I am not an avid comic book reader, but i installed this service because i like to download them from time to time, and it's a lot easier than having to do this process manually. Another great service to have on your media server is Lazy Librarian. 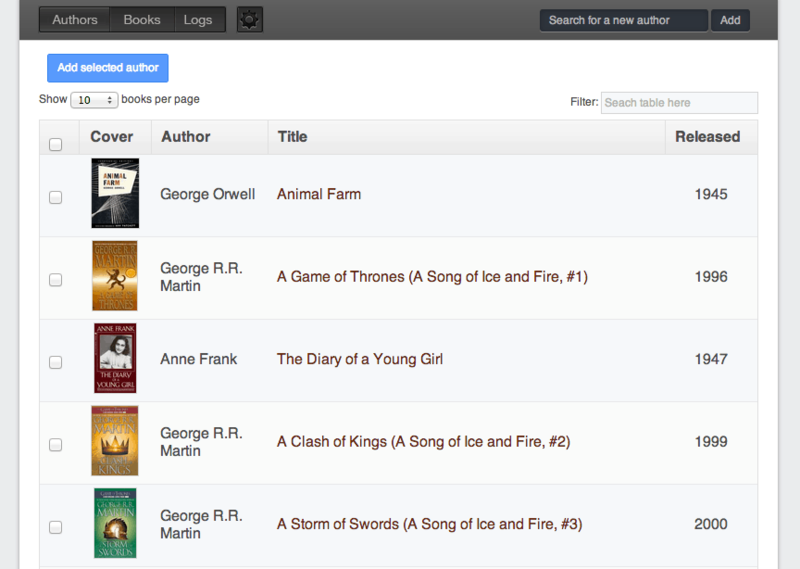 This service allows you to download books for your book reader or tablet without having to go trough a complicate process. There are a lot of forks for Lazy Librarian, because the main service development has stopped about 5 years ago. The best fork I used is from lazylibrarian's github. There's not a lot to talk about this service, so if you are an active reader and you are looking for books, you can go ahead and install Lazy Librarian using our AtoMiC ToolKit. The install process takes just a few minutes, allowing you to star your next chapter as soon as possible. These are the 9 best server apps to automate media management that make you life easier by automating the download process. If you also need a server on which to install these services, make sure you check our Budget Headless Home Server Build 2017 for serving media article and see what it takes to build a great server on a budget. If you have any questions, Please leave comment and ask, we will do our best to help you.